As you might know, on Kayture’s 4th birthday, we sent out 5 gift boxes to some of our long time, to the bone, loyal readers who have been following the blog with so much love and dedication for ages to thank them for everything. I got informed that some of them already got the gifts! Seing their beautiful, happy faces just made me so incredibly excited! It makes me want to do these kind of things even more and more. That’s why, during our stay in Paris, we decided to announce a meet and greet after one of our main shows. So many of you showed up despite the rain : we hugged, made tons of pictures, videos, exchanged wishes, gifts and just laughed so much. Because many of you sent also letters to my hotel room, I felt like I’ve never been that close to you and that made me realize that it’s what I love the most about what I do : is to be able to meet you guys, inspire you and get inspired by your words, create a positive movement and spread love and kindness, push each other to the limits and encourage ambition and drive towards the biggest dreams. I hope to do it through my blog and hopefully, soon with music. It’s my goal to keep going and well, I can’t wait to do even more meet & greets with you all this year. Absolutely wonderful outfit, so classy, so stylish, so you! How wonderful that you had such a blast and that the re-launch of your Twitter account makes you so happy! It's still so nice in my opinion that you sent out the boxes to 5 of your faithful readers, it confirms me again that you are an outstanding, friendly and generous young woman. And for sure I love your white look with the cognac accents a lot! You look so lovely in this white look! This is such a gorgeous look! I am in love with this look. It is so chic and sophisticated, yet fun. I am a huge fan of winter whites. Stunning! I've bee KayCrazy about this blog and adventures of the KayTeam for a quite long time! I found it by accident and absolutely felt it love! Kristina is such an inspiration! She makes her dreams real everyday but she is also a girl who shares it all with people. I absolutely admire and appreciate the whole KayTeam for what they do. I also have to say that Meet&Greet idea is just brilliant! I hope I would have a chance take part in it too. You look so beautiful, especially the last picture is amazing. I'm seriously so jealous of your hair, it's GORGEOUS! Amazing look, you are so beautiful and talented! Absolutly stunning, like this white outfit! i think everywhere in general produces a magic that you can't find at home! You look amazing! I love all white looks! I love the white on white, especially for the winter! And the wide leg pants are lovely! Extraordinary look! So beautiful! I can feel that you have opened up more and I am glad you did. Amazing trousers! and lovely photographs! Beautiful white ensemble and I love the pops of brown! The Chloe purse is lovely! You could totally pull off the all white look!!! Hi Kristina, I'm so sorry for this long message! I just started talking and couldn't stop sharing with you. I hope you don't mind :-) And I also hope that you're starting to feel better after getting sick. It's so great that you are trying to meet as many of us as you can! I would love to meet you and thank you so much for being such an inspiration to me. I live in New Zealand though, which is a few very long flights away! Hopefully one day I will travel to Europe or USA and it might happen. But for now I thought I'd share with you just how much you have helped and inspired me. When I first started following your blog 3 years ago, I was in a place where I didn't feel confident in my style anymore. I liked to dress quite simply and elegantly just like you but I didn't really see many other young people who dressed like me. I was so relieved to find your blog because finally I had found someone who I could really relate to. After just a few weeks of seeing your outfit posts I got so inspired and slowly started to get more confidence in expressing my style my way again. Now I hope I don't bore you with my life story... but I feel like you're the one who gave me the courage to just go for it. And I want you to know how much of a difference you have made in my life, which seems so strange because we haven't even met haha. But about 2 years ago I made the decision to follow my growing passion for personal style (something that probably would never have occurred to me if I hadn't been following Kayture). I began to study image consultancy which has taught me so much about style, colour and women and our different bodies. It has honestly ignited such a passion in me. Seeing how much of an inspiration you are to all of us, all over the world, I really admire you for it. I now want to use the knowledge I've gained to share and help other women embrace their beauty and express themselves through their personal style. I love the message you spread about supporting each other and sharing the love. It's just so important in a world that can be so full of sadness and terrible things happening. Oh and I love this white outfit that you wore. The brown accents are very classy! What a great look in white and cognac! So Seventies! So simple but beautiful look! Gorgeous all white outfit! Your Chloe bag is the perfect accessory. It was definitely one of the best decisions you've ever made, to get closer to your readers. You come off as very authentic and you talk straight from the heart, and this is why we love you and feel like we actually know you. I hope the five winners are having fun with their goodie bags, and I do hope you'll be doing something else that's similar to us! Other than that - I can't believe this outfit is a combination of H&M and Zara. You really know how to make an outfit look super sophisticated without being fully designer. I actually thought THIS was the Elie Saab outfit - can't wait to see it! Hi darling!!! These images are pure love!!! I adore the last one, you seem like a very fabulous actrise!!! I would love to meet you one day!!! Come to Italy Kristina!!!! This outfit is so lovely ! If I lived in Paris I would have been at the meet and greet... but I'm actually quite far from Paris even if I'm still in France. I'd like you to come and discover Bordeaux, I'm sure you'd love it ! I love, love, LOVE the outfit! All white is SO chic and feminine, and you rock it! Such a classy all-white outfit, you look really elegant and beautiful! Cute bag too, love the feminine rounded design and the luxurious looking gold chain strap! 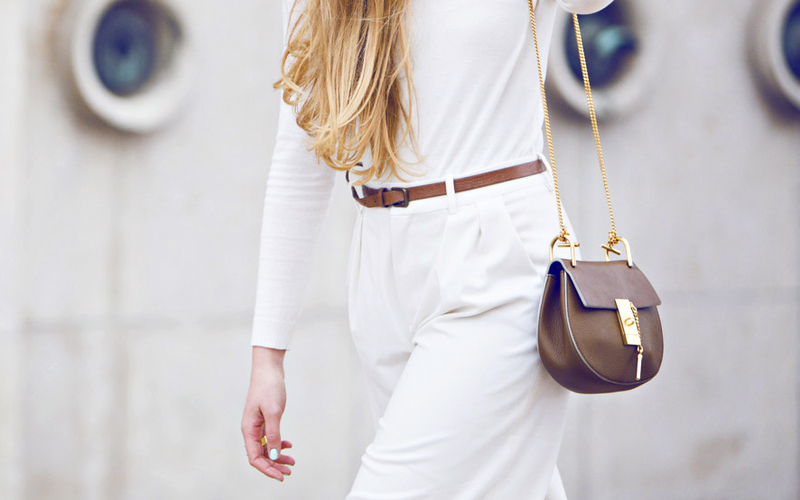 Love the all white look with brown accessories! I really, really LOVE this outfit! White looks amazing on you dear! Impressed by the way you can enhance a staple like this H&M sweater, great look ! I really wish you will visit Moscow and make a meet and greet with us here)) It would be such a wonderful time! J'aime beaucoup cette tenue. Le tout blanc est une combinaison parfaite. Et avec les petites touches de marron / camel... Encore une fois zéro défaut ! Quel sens du détail ! Le séjour parisien a été de courte durée mais il a l'air de t'avoir agréablement marqué et j'en suis heureuse. C'est vrai que de beaux liens se tissent entre toi et les lecteurs du blog, tes followers et c'est génial . J'adore l’interactivité sur Twitter ! On a l'impression de faire partie de ton quotidien. Et comme tu en parles...le colis... Merci merci encore !! ça me touche quand je lis tes mots de me dire que je suis l'une deux. J'ai été présente depuis un petit moment et je ne suis pas prête de partir !! i love the fact that you mixed high end brads with more affordable pieces and the look felt so polished and clean. I love the all white! A great look for you! I always get inspiration from you! you're so beautiful and classy! I absolutely love this all white look, so clean and chic! I like the AllWhiteEverything look, but the turtleneck isn't my favourite..
tu es tellement belle dans cette tenue , que ,de te contempler ,je suis ivre !!! Absolutely love following you on twitter. Would love to get a chance to meet you if we're ever in the same city. But it's very inspiring to see you meeting up with your fans and readers! the last picture is truly amazing! I'd just bought white pants yesterday. hope it will looks gorgeous when I'm wearing that pants like you did. Congrats on your twitter relaunch. You're so successful at such a young age. love this white outfit!! amamzing!! So incredibly gorgeous, that all white look is perfection !! I can't believe this look is H&M and Zara! Only you could make an all white outfit look this chic, Kristina! I'm going to definitely have to give a solid color look a try. I love how hard you work with your readers, to get to know us, meet us and build a community where we all can come and inspire each other. I'm so thankful I stumbled across you and your blog! I can't wait to see your Elie look soon and hope you're healthy and back to feeling better! That is one of my favourite outfits from you! It is so elegant and timeless - just wonderful! I'm always super happy when I see that you favorited my tweets ! Even if it's just clicking on an online button, it already means a lot. It means that we can actually interact with you. Tu es d'une élégance incroyable dans cette tenue ! Une fraîcheur et un chic dingue se dégage de toi dans cette tenue ! Ce n'est pas tout le monde qui peut se permettre d'être aussi jolie dans une tenue comme celle-ci. I always enjoy reading your blog posts, just as much as I enjoy looking at the pictures. It's so nice to see a blogger who is so connected with their fans and pays so much attention to them. You mention your readers in almost every blog post, it's refreshing to see! I really enjoyed this look, the white on white is very clean. This outfit is so sleek and classy. One of my favorite looks from you so far! I love this simplicity! So classy and very chic! Your incredible! I love your outfits and you are one of the prettiest people I have ever seen! You, Kristina, are such an inspiration to me and I hope I can go to one of your meet and greets someday! And I really like the total white look. For some people it's not their thing, but I'm all for it! you look so so good! We check Kayture almost on a day to day basis to get a little inspiration. Thank you for those! An all-white look is a Winter must. Really nice, so Dainty and Chic! Wow! You look so elegant. I will be attending London Fashion Week and have been going crazy trying to decide what to wear. Definitely inspired... Btw, will you be coming to LFW? Bisou! Wonderful outfit - very classy! Your blog is like reading your favourite magazine, but better and with an endless supply of beautiful photographs, I'm so in love! I like this outfit and the pictures are very good, the last one in particularly, the black and white one is very beautiful! All white in the winter its amazing! very love your style! Bloggers really too beautiful, what clothes to wear on your body is so perfect. Absolutely think you're darling! I love looking through IG to see you latest post and reading your blog inspires me! Keep up the good work and always stay smiling. Would love to meet you one day if you ever come out to San Francisco for some reason!!! I'm always up-to-date with your looks and travelling adventures and follow your blog passionately. You absolutely are my idol and inspiration source for my own blog ( of course I put you on there as well :P) . Now I did something crazy and booked a flight to the Paris fashionweek for a weekend to take a bit of streetstyle shots. Hope you will be there too! And do you need to be invited for the shows (not only refering to the Céline show) or is it possible to buy tickets? Do you know about that? I really really hope to get an answer because I'm so frustrated by not finding an answer. Go one and keep your positivity and smile. Great I love this ! Great style. I like white. It is always a great decision on hot, sunny days. Such a perfection and big inspiration! I love your blog and your style! Nice all white look! There’s something so amazing and chic about all white outfits, I love them. Amazing pictures! Great look! Would be great if you had tribal tribal tattoos for men! Great Pictures. It is so elegant. Just loved them.